From the freezer: frozen kale, and one of those bags of frozen veggies that includes carrots, peas, green beans, and lima beans (oh shush, you won’t even notice them!). Put some veggies in a microwave-safe bowl. Add some water. Cook for a minute or two, stir, etc. From the cupboard: packet of ramen. Crunch up the ramen into smaller pieces while still in the package so it doesn’t make a huge mess. Meanwhile, boil water in a kettle. 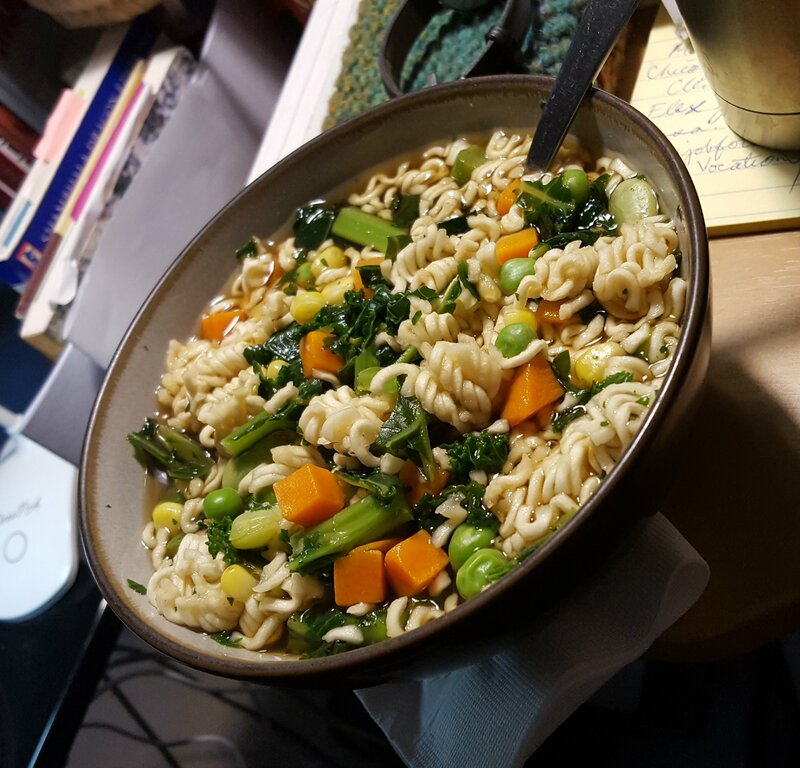 When the veggies are cooked from the microwave, dump the pieces of ramen in the bowl with them. Throw away the icky packet full of MSG. You won’t be needing that. Pour boiling water over the whole thing. Stir a bit. Get the veggies to rise and the ramen to sink into the boiling water so it can cook them. From the fridge: grab a tube of squeezable ginger and squeeze some in there. From the cupboard: dump some soy sauce in. Dump some rice vinegar in. Shake some garlic salt over the whole thing. Optional extra: Ideally, if you have leftover baked tofu, cube it and dump some of that in there, too. Or if you’re doing things the bachelor way, don’t bother with cubing it, just tear it into pieces and throw it on in there. Your stomach won’t care if the tofu has crisp clean edges. Another optional extra: I’d really like to add miso. If you have some around, go ahead. Last optional extra: If you have some seaweed about, go ahead and toss that in there too. Really last optional extra: So you could pretty much throw whatever you want in here. Some sauteed garlic would not go amiss, truthfully, but I just don’t have time for that right now. Time elapsed: Five minutes plus however long it takes you to eat. This can be eaten at your desk while writing a blog post about it. As you can see. And seriously, don’t be a baby about the lima beans. Just pretend they’re not there. YOU WON’T EVEN NOTICE THEM! I don’t notice them, and I’m picky. Though of course YMMV. And this counts as vegan. It is NOT gluten-free, but it totally could be if you use gluten-free noodles. It has green stuff in it, so your mother will be happy (and seriously, even if you don’t cook, you need greens in your diet–I wrote a book on nutrition–stop laughing, I really did–and I know these things). Yay! Huzzah! Cooking has happened! In a messy kitchen that really needs to be cleaned up but won’t be until later, and in under five minutes, and it really actually tastes pretty good. It’s not gourmet cooking, but we don’t care, right? We are busy people! Previous Read the tarot, do the work: Job-hunting. Thanks for a great sounding Ramen dish. I throw away the packets but it tastes so Bland the way I have made it. This will be a great tasting change. Love all your articles on your website. Found you on Angela Hoy,s website. Bonnie. I apologize for the error in my reply left above (please omit the Sci-Fi comment). I loved your Financial and Budgeting tips (on Angela’s website/email newsletter). Thanks for your comments–and I’m sorry to have been so slow to reply. No worries about the typo, it happens, even to me!